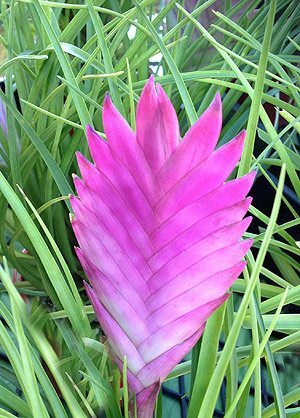 An outstanding small bromeliad, Tillandsia cyanea or ‘Pink Quill plant’, produces a long lasting bloom that consists of a tall pink to mauve flower bract or quill, with individual blue flowers opening from each segment from the lower section mooring towards the top. The flower spike or bract will last for 2 – 3 months and will hold its co lour well. The individual blue flowers will last 2 – 4 days before dropping off and the next one appearing. This is an evergreen plant, the foliage is a mid green and strap like, attractive in itself. The blue flowers have a gentle fragrance, more apparent in warmer weather. The flower spike will be a deeper co lour in brighter light than in shade. Flowering is more prolific during warmer periods, many gardeners will grow this wonderful easy care plant on a warm patio for this reason, however they can also be grown in the garden given the right conditions. 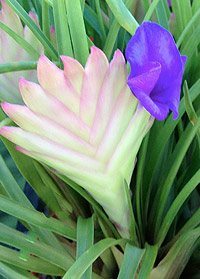 Pictured right is the flower bract of Tillandsia cyanea and it becomes apparent why this is often called the ‘Pink Quill plant’. If you are looking for other spectacular species then Tillandsia dyeriana is well worth a look. These are actually an epiphytic species and in nature would grow on a tree or piece of failed wood. They also perform well in containers and are usually sold this way. If grown indoors a well drained growing medium is essential, water every 2-4 weeks. Best suited to a well lit position, good strong filtered light. Indoors use a fertilizer high in nitrogen and potassium to encourage good growth and flowers. 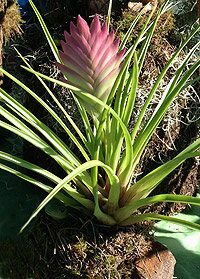 Outdoors Tillandsia cyanea will need little fertilizer at all. Pictured right we have the true flower of Tillandsia cyanea a series of vibrant purple to blue blooms that appears progressively from the lower part of the flower bract towards the top over a period of 2 -4 weeks. You will notice that the bract itself on this particular plant is not as pink as some, this is due to a slight lake of light. A week or two in brighter light and this will color up nicely. Tillandsia cyanea is available for sale from the following nurseries. Thomas and Rene Neville from ‘The Buddha’s Garden Nursery’ in Gippsland has been growing these wonderful plants on mounts (see picture far right), very successfully, for a number of years. Closer to the natural growing conditions that the potted specimens we see in Garden Centres. They sell a range of bromeliads mounted and in containers at markets around Victoria. You can contact Thomas on 0498 102 774 or Rene on 03 5668 1667.